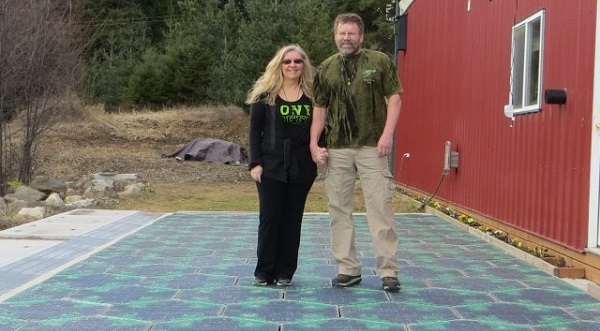 Scott and Julie are the co-inventors of Solar Roadways. Scott is an Electrical Engineer (MSEE) and Julie is a Counselor (MA LCPC LMFT). Scott has worked in the engineering field for over 25 years and his main fields of expertise are in hardware, firmware, and software. We started working on our project in 2006. It’s been quite a journey taking our concept from a dream to where we are today, poised to become product ready and make the world a safer, greener place. The implementation of our Solar Roadways project on a grand scale would change the world as we know it in significant ways. Imagine the possibilities of a post Solar Roadways world: Your home could be all or nearly off grid thanks to your solar driveway (which you no longer have to shovel or plow if you live in the north), patio, or walkways etc. 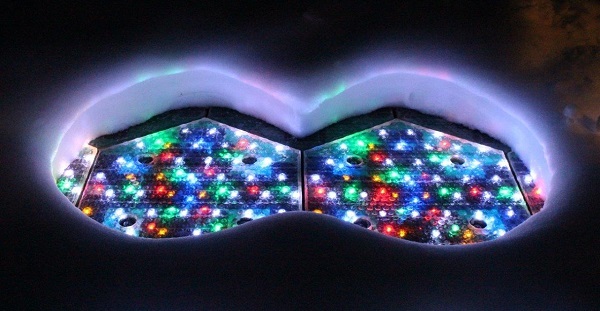 When you leave home, you’ll be driving on Solar Roadways which are snow and ice free, pothole free, and the LEDs help you see the lines clearly and easily, especially at night when many people suffer night blindness. 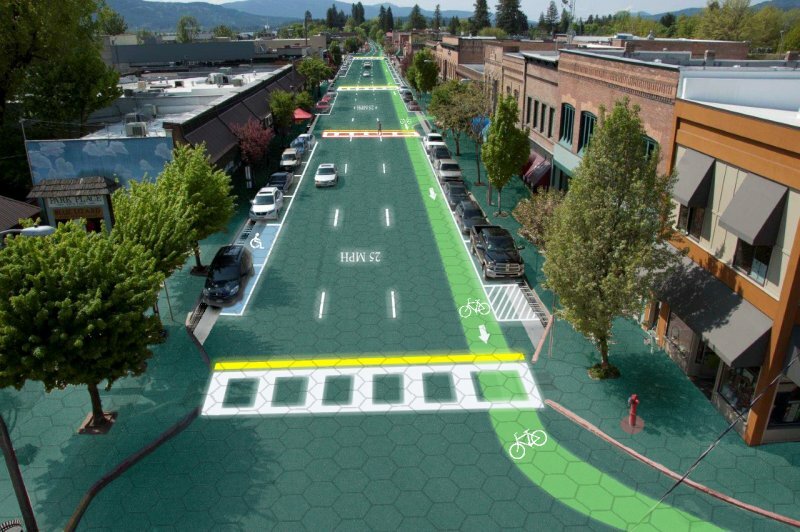 Artist’s rendition of downtown Sandpoint, Idaho – Home of Solar Roadways. A study in the UK showed that LED markers on road lines reduced nighttime accidents by 70-percent. If there is danger ahead from a deer in the road or a sudden accident, the intelligent road can sense this and warn you to “Slow Down”. This will save the lives of countless animals and keep people safer too. If you go somewhere new, the intelligent road can direct you with an LED-lit arrow that you follow to your destination. If you have an EV, you can stop and charge at a solar parking lot while you work, shop or eat, using clean energy from the sun. Eventually, you’ll be able to charge while you drive via mutual induction panels. Solar Roadways will provide the infrastructure to make this possible. Solar Roadways - Current Activities! What’s been happening since we closed our original campaign? Perks! We had over 48,000 donors – an Indiegogo record for that time. That equated to over 30,000 perks to process. Most of that was done by four generations of family members while Scott continued with the engineering work. Paperwork! Due to the Indiegogo campaign, the Federal Highway Administration (FHWA) was nice enough to extend our Phase II SBIR contract final report deadline. We completed a successful construction and testing contract with the FHWA at the end of the year. Renovation/moving – we wrapped up our original campaign in June. Soon after, we were hard at work searching for an economical and suitable building to purchase in Sandpoint, Idaho. 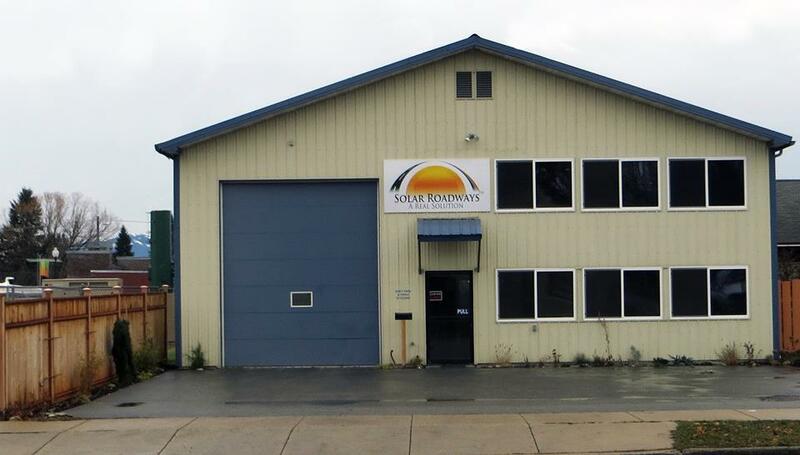 Thanks to your generous donations, Solar Roadways was able to go from a “garage operation” to a more traditional business. Our “new” building needed work: we required both office space for engineers and shop space for manufacturing. We couldn’t find anything ideal, so we improvised and renovated an 18-year-old shop building to meet our needs. There are additional potential projects in the works, which we are not currently at liberty to discuss. Hint – many of them are extremely exciting and we can’t wait to share when we have permission! Our intent is to install as many of these projects as possible later this year. We’ll monitor each of the installations and correct any glitches. Since we have already monitored our own prototype parking lot for four seasons, we don’t expect many problems, but these will be public installations, so we may have a new learning curve! After we’re convinced that our panels are commercially ready, we’ll make them available to the world – if all goes according to plan, that should take place in 2016. The first product available will be for non-critical applications such as parking lots, driveways, bike paths, sidewalks, etc. Robert's Sidebar Note: Solar Roadways has just reopened a permanent fundraiser campaign at invitation of Indiegogo InDemand staff for those that have been asking to donate but was not able to last summer. At the same website as last summer, and a few extra perks have been added to the donations which will be updated and changed from time to time. President O'bama mentioned entrepeneural inovators help make this country great in his State of the Union address last January of this year. (at the White House blog on the address they included slides of active projects and Solar Roadways was listed there) Solar Roadways also has links to a new video from Indiegogo Docs and Innovation World put out by Henry Ford Foundation and News feeds are popping up all over the place again. Go check out the new campaign and get involved! Solar Roadways - Future Plans! While we’re supplying the non-critical application product, we’ll continue working with civil engineering labs to make the product ready for roads and highways. There are still several tests to be performed before we will be ready for our biggest challenge – highways: advanced loading, sound testing, shear testing, deflective testing, etc. Once all of these tests have been passed, we should be ready for the world’s roadways! 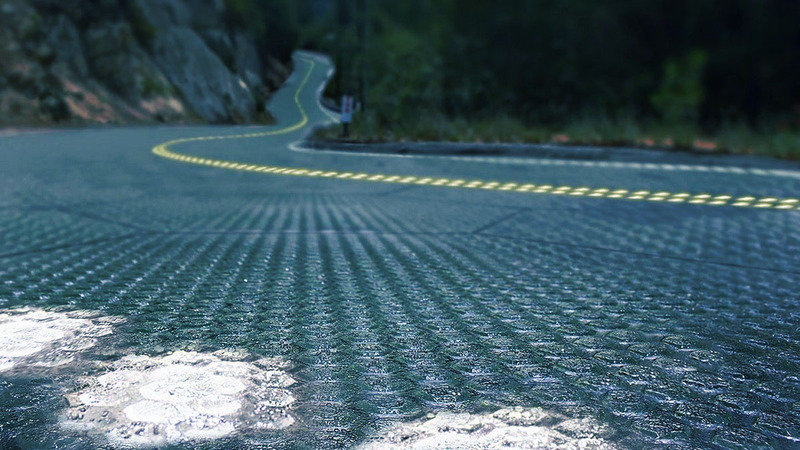 Solar Roadways is a modular paving system of solar panels that can withstand the heaviest of trucks (250,000 pounds). These Solar Road Panels can be installed on roads, parking lots, driveways, sidewalks, bike paths, playgrounds… literally any surface under the sun. They help pay for themselves primarily through the generation of electricity, which can power homes and businesses connected via driveways and parking lots. A nationwide system could produce more clean renewable energy than a country uses as a whole. They have many other features as well, including: heating elements to stay snow/ice free, LEDs to make road lines and signage, and attached Cable Corridor to store and treat stormwater and provide a “home” for power and data cables. EVs will be able to charge with energy from the sun (instead of fossil fuels) from parking lots and driveways and after a roadway system is in place, mutual induction technology will allow for charging while driving.